Tomorrow the Auckland Transport board meet again and here are the most interesting bits from their board papers. There doesn’t seem lot of interesting items on the closed agenda this meeting with most of the items relating to more clerical issues such as a procurement policy or budget template.The only thing of note is the New Bus Network Design for Waiheke Island. Here what I think are the most interesting bits from the main business report. 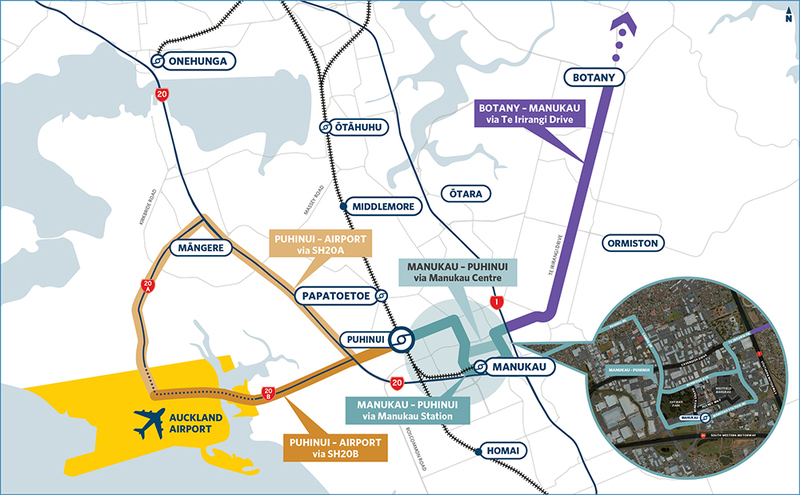 Airport to Botany – one of the big unknowns with this project is how the busway it will travel through Manukau and whether the route would go via Ronwood Ave or Manukau Station Rd. AT say more work has been undertaken this year on the route within Manukau and involved the Ministry of Housing and Urban Development and Panuku Development Auckland. Also that there is now an emerging recommended staging plan and that will feed into business cases for the project as well as development plans for the two mentioned agencies. Auckland Transport and Panuku are looking at the feasibility of integrating residential and or commercial development on existing park and ride sites. The Panuku led strategy will identify the most promising existing sites for development. I look forward to seeing the outcome of this. Sustainability – Another thing that I’ll be looking forward to seeing is this issue. The carbon footprint aspect will be particularly interesting given the transport sector playing a large part of local emissions. AT Mobile – AT say there are now over 150k active users of the mobile app and that progressive roll out from late March (now) will see users be able to see their HOP balances on the app. Audio announcements & WiFi – AT have been trialling audio announcements on two buses (an Airporter and Northern Express bus). They are also starting to roll out WiFi on some buses. have the integrate with the AT Park app in the future. City Centre travel times – As part of the CRL consent conditions, car travel times in the city centre are being closely monitored. 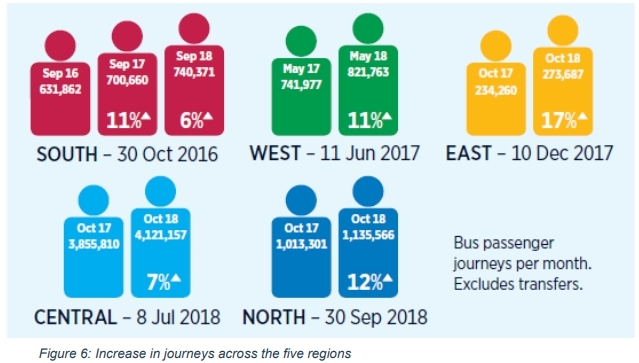 Up until this year one of the most notable impacts has been the lack of any real impact as despite effectively taking Albert St out of the network, on most corridors travel times have actually improved. The only exceptions to this were Quay St and Customs St and both were only slightly worse. 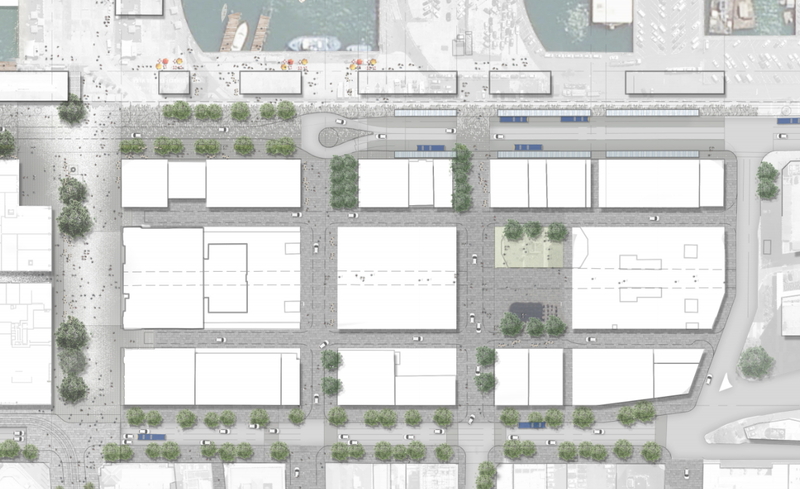 Over Christmas the scale of disruption increased with the downtown works kicking off which has seen most of Quay St narrowed to two car lanes, which is how it will remain going for the future. The monitoring is showing that travel times did decrease slightly again on those two streets but the other roads being monitored are unchanged, if not better are this year. We’ll have to wait to see the impact in February and March but if the same overall trend remains, it will continue to show that removing traffic lanes doesn’t actually impact cars as much as many people like to assume. Parking Management – AT are working on a number of parking management plans, including at New Lynn, Sandringham and Papakura but the notable one is Devonport, which they expect to be completed by the end of June. It still seems silly they didn’t complete this and implement any changes prior to starting their rideshare trial. Puhunui Interchange – AT note that the developed and detailed design stage works have begun, that they’ve completed the early contractor tender evaluations and the documents are ready for non-notified consent. Parnell Station – We should be seeing canopies for the ticket gates at the station starting construction soon. Lincoln Rd – The project is now under review to “identify options to reduce designated footprint and land acquisitions“. 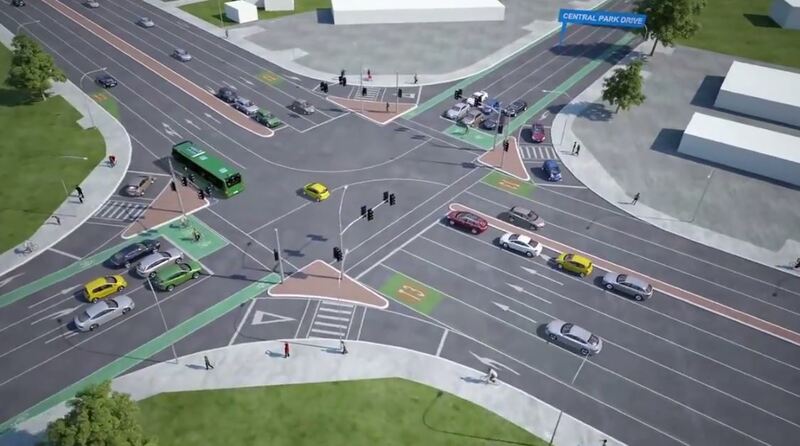 The cynic in me things they’ll target the protected cycle lanes but perhaps they should start with the ridiculous supersized intersections. They should also implement proper bus priority, as per their own strategy for the corridor. Hobsonville Ferry – AT have noted this early result of the introduction of weekend services. It seems a good result, especially in comparison to their Devonport rideshare trial. On-Demand Services – speaking of rideshare, they say WSP-OPUS has been awarded a contract to develop a roadmap to “identify a tactical plan to implement on-demand service offerings in Auckland“. A separate report is going to the board on the new bus network, including some of the things they’ve learnt. There’s not a whole lot new in there but there are a few interesting comments. Perhaps one of the most impressive outcomes of the changes is how much more efficient the network is. This is highlighted in the comment below. 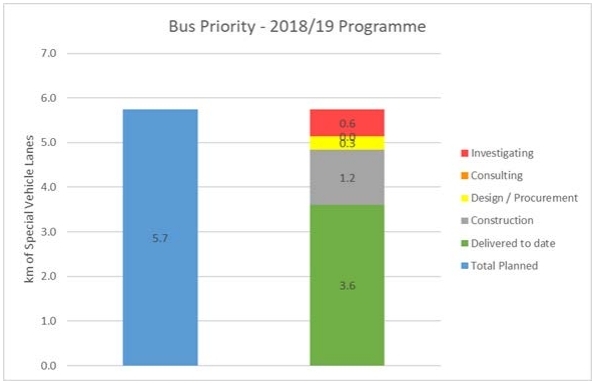 The implementation of the New Network for buses has seen an increase in service levels of 32% (measured in in-service kilometres) over 40% increase in driving hours, creating more than 300 jobs and a 15% increase in fleet size with capacity increasing by more than 20% at peak times. This was implemented with an approximate 7% increase in cost. 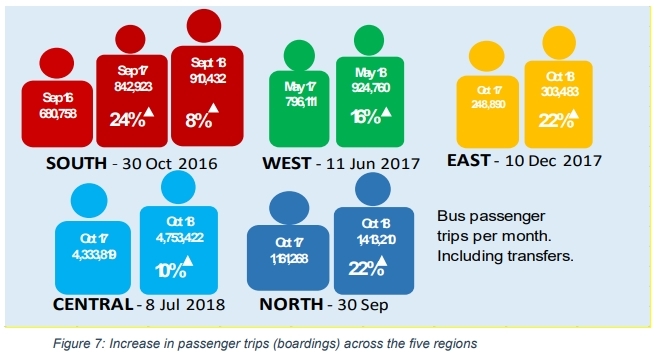 One in six journeys now involve a transfer and that has seen overall boardings increase a bit faster, as shown in this version – as a comparison, in some overseas cities I’ve looked into, more than half of all journeys involve a transfer. That’s all for now, is there anything you’ve seen from the papers I’ve missed? Almost 6km of bus priority measure, when great majority of Aucklanders doesn’t have access to anything except for local bus. I’m not sure if I should cry or laugh here. In complete agreement. Council should outline some key corridors and aim for something like 100km in 4 years. There’s no reason that planning, consultation and delivery on many sections can’t be done in parallel – so the first year is primarily planning and consultation. 2nd is construction and planning. 3rd is construction and finishing. 4th is wrapping up. So, no km under consultation? That is odd, there’s actually a consultation going on for a transit lane in Birkenhead right now. It is a small beginning, I sometimes see that queue stretching to Coronation Road in the morning, but it is better than nothing. What is the plan with the Waiheke New Network? No direct services to Matiatia, only a no stopping service to a new interchange at Stony Batter? And not a shred of modelling to figure out if the new interchange facility actually works? What on earth are you on about? I suggest you have a coffee before commenting. Don’t worry, Miffy is just trying to be funny and have a sly whinge at the same time. Well that can’t be right. I mean it is hardly in the whole spirit of the New Network. The goal has always been to make as many people change buses as possible, to make people go via somewhere they never wanted to go, and to make people cross a fare boundary multiple times so that cash fare customers get gouged when they change buses. If they got the people who did the North Shore to do Waiheke then I would fully expect them to build a new interchange facility in the least accessible place on the island and make everyone go via that. For chrisssakes MIffy, just get a hop card already! …and if you want decent PT, don’t live in the arse end of Greenhithe. To start with Miffy do you know were Stoney batter is ?. And the inter change place on the Island is Placemakers , and say if you catch a bus from Palm Beach and want to go to Onetangi ask the driver to call through on their RT an they will get the connecting bus to wait for you . And with the new routes the interchange places will be at Ostend for Palm Beach and Donald Bruce rd for Kennedy point for the car ferry and if you are at Palm Beach and want to go to KP change at the SPCA , and it’s as simple as that . I also noticed that Waiheke’s rollout won’t start until october 2019 so that means it will be up and running for the summer timetable . Air Quality seems to be missing from that list, which needs sorting as AT’s own buses and ferries are hugely problematic and well documented sources of dangerously poor toxic emissions, especially in the city centre. Diesel fumes are a known carcinogen, and would never be approved for public use if introduced today. Additionally, targets for lowering driving volume, as measured by kilometres travelled in the region, both per capita and gross (good data on this too), are absolutely essential if Auckland is to play its role in meeting CC emissions targets…. properly prioritising these measures would underscore the need for significant change in both budget allocation and road design (eg Lincoln Rd should never look like the scheme above…). Yes, I was kayaking out at Rangitoto a couple of weekends ago and the ferry practically disappeared in a cloud of black smoke as it left the island. Yes some/most/at least one (I sucked in the other day) of the Tamaki Link buses are terrible & old. This is a pity considering the showcase kind of visible route they are on. I realise they were a kind of “last minute” change of Central New Network idea. That model bus were praised when new as being euro 3 compliant and they did have little if any visible emissions when new. But now older, several hundred thousand km later they are filthy. Hence never get sucked in by all these dazzling claims of euro whatever emission standards, they are big dirty diesels, only as good as their age and servicing! We know that AT already has targets for fuel usage reduction, attainment of which should have been assisted by the new vehicle fleet becoming more fuel efficient. (If there has been a trend to larger vehicles that would have been counter productive.) AT badly missed these targets and the first response seems to have been just not publishing results any more and to talk of resetting the targets. So there has been no consequence for failing and I am not sure what consequence for failing there might be in the future. I wonder if a better approach is to start from the budgetary end. Let’s decide how much we want to spend on PT and roads and let consequences flow from there. The Botany-Airport route would be a lot quicker if it didn’t divert to Manukau. Still waiting for vehicle emissions testing to be part of WOF. I would expect there to be two service patterns, much like the NEX1 and NEX2. One would run via Manukau and one would run Botany to the Airport direct. It’s an advantage of BRT and allows a range of different travel options to be prioritised. Manukau is an important hub, source of riders; dingbat 1960s planners put it by the motorway, which is awful for people, and severing. And completely off-line from all viable transit networks, hence the stub rail branch line, and now deviating second RTN… such was the zeitgeist. At least that AT carpark is now full most the time. So a less dismal ROI than before. The last figures that I saw showed that this years Ronwood car park surplus would only pay for the cost of new lighting. It doesn’t sound like a great ROI to me. Would it have being any better at Wuri with a quarry on one side and an industrial area on the other. Although maybe I haven’t being in Auckland long enough maybe Manukau city predated the Wuri industrial area. “Still waiting for vehicle emissions testing to be part of WOF. :” Totally agree with you Anthony. Along with vehicle exhaust noise measured. Shame the Greens are all about social engineering and not about “green” issues now. Perhaps Vernon’s Blue Green party will be truly green (unlike the current bunch). It would be even quicker if it didn’t stop at all! So let’s summarise that story. Off the rail track → need stub line. Then build the stub line but intentionally keep it too short → now all buses on Great South Road have to make a detour to the station. Now A2B has to make a detour. So, what’s next. Maybe we can put that new town centre away from that line. Oh wait. Ormiston — old news already. Other countries spend a lot of dollars and get good PT. We spend a lot of dollars and get this weird stunted PT. There’s a certain design skill lacking over here. Land use planning is transport planning is land use planning is transport planning…. ISTR that the Manukau Line was truncated because Westfield didn’t want it under the mall? It wasn’t ever going to be under the mall, it was considered for council owned carparking next to the council offices. From what I understand they wanted the station about two blocks further along, but the government wouldn’t pay and the council didn’t want to pay the difference either. So cut short to make it cheaper. I remember reading somewhere that it was truncated short due to lack of funds to take it further east. The suggestion was to Gt South Rd or under it to between GSR and motorway? Yes lack of funds to go further. It was going to be next to the council building, under osterly way. Manukau City is not just about the mall. Initially I was disappointed with the location of the station however I am now much more happy with it now. A quick walk across the park gets you to the Super center. There are other business and govt and council offices police and the court within easy walking distance. The great new bus station has just added to Manukau becoming more than a mall. You could call Botany just a mall but not Manukau. The proposed bus way to the airport can only help as would a southern rail link. Just dreaming there you wouldn’t want Manukau becoming more important than the cdb. The stats on bus new networks will be slightly skewed by the fact when you transfer, just miss the next 30min service & so the 30min is outside the 30min transfer time. So you fill in time ..on your phone or something else…..Then would count as another journey. Also REALLY screws you up as it did me the other day as the driver of the next one didn’t even stop at the starting point like normal as he came from his return trip right on the departure time to leave ….grrrr… so gave up and walked home in disgust. I have just a similar problem got off the bus at 7am got back on the next at 7.30am and it stung me an extra 1.95 as it said 1/2hr on their page have tried for a refund and in the comments section it would not allow me to write a descent comment explaining what had happened as it cut me off after around thirty characters . They are going have to fix that error or can they not read long replies/explainations ? Yes the 30 char limit is useless. Can understand they won’t want too big, but 30??! Happened to me too. Got off 380 from airport. Connecting bus was late so waited 31 mins. AT would not refund. The transfer allowance is too tight especially when going from A frequent service to a less frequent connector. No update on the cycling programme? We have a cycling programme?!? What channel? Does Hosking host it? Good news they are going to start the new bridge between Onehunga and Mangere bridge mid year. I am a bit surprised its going to take two and a half years though. Damn site quicker than the last one. Is that the pedestrian, cycling and fishing of bridge or a rail bridge? What’s happening with Wi-Fi on trains? It’s never gotten beyond that one set that had it as a trial. Included in the line closures section, on 23-24 March western line is closed and one reason is to survey for Henderson station CRL upgrades. There is detailed info on CRLL web pages of Otahuhu platform 3 CRL updates but this seems to be the first mention from AT concerning Henderson station upgrade. There has been mention previously (can’t remember where. Changes at Henderson include an additional platform to enable the short running services to turn around (I realize that the train doesn’t physically turn and just runs in the opposite direction, before someone accuses me of not knowing again). We should have gone with the hybrid battery EMU’s instead of the Pukekohe electrification. They could be used on other routes if electrification eventually happens. The hybrid EMU’s could have being operating now. They couldn’t have been used on other routes, the battery systems only last a few years before needing replacement so they would have been returned to regular EMUs for use on Pukekohe electrification. They were only ever intended to be a stop gap measure to full electrification. However the cost of a replacement battery pack was in the region of 400k and even this was expected to reduce in future as battery technology improved. So life as bemu could be almost indefinitely extended to the service life of the emu. A rare moment of agreement for us Bogle. We could have replaced the batteries and run a service to pokeno once electrification was extended to Pukekohe. Or run a proper all day BEMU service to Kumeu with a little work in the tunnels at Waitakere. Except that they wouldn’t have had enough trains to do that, you would have needed to order even more trains at the time to extend the line to Pokeno. So in other words if you want BEMUs for Pokeno, just order and run them when you want to go to Pokeno. It would seem that this last tranche of emus due for delivery this year are different from existing emus in that they can have onboard traction battery packs installed. So the question is have AT actually ordered BEMUs that are just EMUs because a $400k traction battery package is missing? If this is actually true then has AT continued its research into acquiring suitable battery packs? Since it had already identified alternate sources apart from the more expensive CAF sources batteries. Since it’s now obvious we will not be seeing wires to Pukekohe anytime soon, shall we see BEMUs replacing the DMU shuttle? Don’t read too much into “provision for” energy storage, it will mean little more than a potential load point on the roof to mount them. When we were talking about BEMUs I heard, admittedly third hand, that they were practically identical except for the battery packs stuck up top. Ok, I take your point. Although railway gazette tends to be accurate in its reporting so my optimistic view is still thinking we get ‘almost’ BEMUs. BTW, traction batteries would not be lightweight, perhaps even a few tonnes, so under frame storage is most likely. I can’t imagine OSH happy with over-passenger-heads traction batteries. I can feel an OIA enquirey to AT on the way. Yeah we hear a lot about ‘future proofing’ in this industry. Most of the time it just means “not making it entirely impossible to retrofit something at a later date”. Apparently there is no room under the floor. Recall we have raised floors with steps in two out of three cars just to fit the existing components in. Battery pack above passengers heads is ok as long as it’s outside the passenger cabin fire cell. Don’t forget there is 25kv power conduit up there already!